Salonga National Park is Africa’s largest tropical rainforest reserve covering about 36,000 km², it is defined in law as ‘une reserve naturelleintegrale’ in the sense of the 1933 London Convention and declared a World Heritage site in October 1984. It extends into the provinces of Bandundu, Equateur, Kasaï Occidental and Kasaï Oriental. 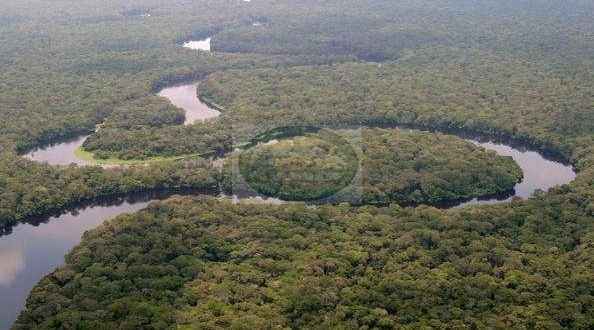 Situated at the heart of the central basin of the Congo River, the park is very isolated and accessible only by water. It is the habitat of many endemic endangered species, such as the dwarf chimpanzee, the Congo peacock, the forest elephant and the African slender-snouted or ‘false’ crocodile. Criterion: Salonga National Park represents one of the very rare existing biotopes absolutely intact in central Africa. Moreover, it comprises vast marshland areas and practically inaccessible gallery forests, which have never been explored and may still be considered as practically virgin. Criterion: The plant and animal life in Salonga National Park constitute an example of biological evolution and the adaptation of life forms in a complex equatorial rainforest environment. The large size of the Park ensures the continued possibility for evolution of both species and biotic communities within the relatively undisturbed forest. Three types of landscape can be recognized: low plateaux, river terraces and high plateaux, each with different associated vegetation. Rivers in the west of the north sector are large and meandering with marshy banks. On the higher ground in the east, valleys are deeper, and rivers may run below cliffs of up to 80 m. The south sector includes the watershed between the basin of the Luilaka to the north and east, Likoro to the west, and Lukenje to the south. Salonga is the largest tropical forest national park in the world. Equatorial forest covers most of the area, varying in composition according to the geomorphology. The principal forest types are swamp, riverine and dry-land. Evergreen ombrophile forest is dominated by well-developed stands of Gilbertiodendrondewevrei . Semi-deciduous forest covers almost all areas between the rivers. Pioneer or transitory communities are found along river banks. Grassland vegetation, rather than savannah, occurs in the north sector, known locally as botoka-djoku (elephant’s bath). The total area of grassland is under 0.5% of the park area. Southwards, the vegetation is more open with esobe clearings. The most important species that has been reported is the endemic dwarf chimpanzee. However, it is absent from the north sector and there is now doubt that it still exists in the south sector. Other species include colobus monkeys, long-tailed pangolin, giant ground pangolin, tree pangolin, hippopotamus, leopard, African golden cat, Angolan mongoose, Congo water civet, bush pig, yellow-backed duiker, okapi, water chevrotain, sitatunga, bushbuck, bongo and pygmy Cape buffalo. Birds include cattle egret, black stork (migrant), yellow-billed stork and the endemic Zaire ‘peacock’. Reptiles include African slender-snouted crocodile. A group of less than 1,000 Ediki lives in Yaelima, Dekese zone, in the centre of the park; while 500 Kitawalistes live near Lomela substation on the northern block. Both are in contact with poachers. It is proposed to relocate them outside the central zone. In order to improve the living conditions of the local population, it has been proposed to farm grey parrot in villages in the buffer zone. Traditional fishing is undertaken in the numerous rivers, as well as hunting and gathering in the buffer zone.